Renaud Bruyère and Adeline Houillon are young winemakers from the Jura who produce a beautiful, light, ethereal Ploussard and a lovely blended, topped-up white wine made from Chardonnay and Savagnin. They are a very small producer with only 4.5 hectares of low-yielding vines, so their production is tiny. 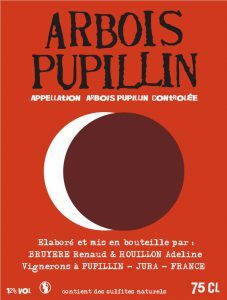 Their vineyards for the red wine are near the tiny village of Pupillin which sits on the hills above the main town of Arbois. When you drive into this village you see a sign proclaiming it as the “World Capital of Ploussard”. Renaud and Adeline have, once again, produced a beautiful, light, elegant red wine from the local Ploussard grape variety. The Ploussard benefits from the Triassic clay in which the vines thrive. Much of their production is sold in two local bars, namely Bistrot des Claquets (where we can always be found when we are in the area) and Les Jardins de St-Vincent. In both of these places locals and visiting Jura afficionados seek out this wine for its purity and finesse. We find the back label (contra-etiquette) on each of the wines from Bruyère and Houillon very informative. As you can see the label is in French but it is relatively easy to get a sense of what they are saying. They start by saying that the vines are managed biodynamically and that the terroir is “argileux du Trias” which is Triassic era clay. The grapes are picked by hand (vendange manuelle) and the grapes are separated from the bunches using a screen that they rub the bunches on (criable). The grapes then undergo a type of carbonic maceration where enzymes in the grape are responsible for fermentation of the sugars inside the grape. As the grapes break down, normal alcoholic fermentation begins via the yeasts on the grapes and this occurs in a tank for 37 days. The term “cuvaison” refers to leaving the skins and pips in contact with the juice so that the anthocyanins which provide the colour are extracted from the skin. The wine is bottled without any filtration and without the addition of any sulphites. The last sentence points out that some carbon dioxide may remain in the bottle as it is a natural preservative that they encourage. This light, red and delicious Ploussard produced by Renaud and Adeline. The vines are managed biodynamically and the terroir is “argileux du Lias” which is clay formed from rocks that were formed in the period just at the start of the Triassic era (Lias). The grapes are picked by hand (vendange manuelle) and the grapes are separated from the bunches using a screen that they rub the bunches on (criable). The grapes then undergo a type of semi-carbonic maceration where enzymes in the grape are responsible for fermentation of the sugars inside the grape. As the grapes break down, normal alcoholic fermentation begins via the yeasts on the grapes and this occurs in a tank for 46 days. There might be a small amount of carbon dioxide in the bottle as Renaud and Adeline like to have a small amount present because it is a very good preservative for the wine. 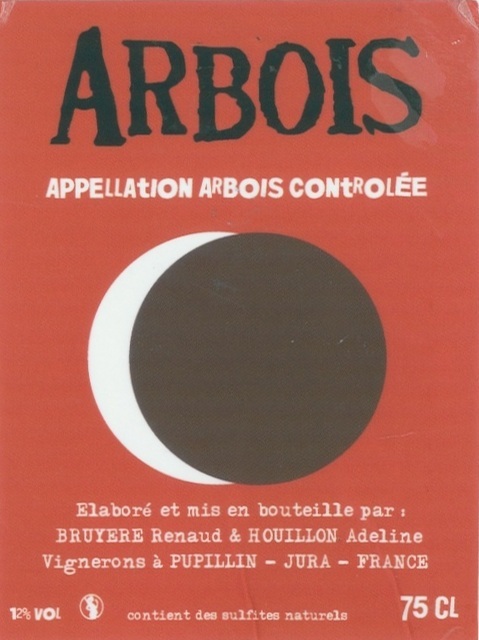 This is a typically beautiful wine from these passionate winemakers who only produce small amounts of these wines from their vineyards around the villages of Pupillin and Arbois. This year we have been lucky enough to obtain two vintages of this stunning Chardonnay from the La Croix Rouge vineyard, namely 2013 and 2014. The wines have been aged in old oak barrels until Renaud and Adeline were convinced they were ready to bottle. We tried these wines side by side when they arrived and were delighted with the freshness and liveliness of both of them. The vines grow in limestone clay and the grapes, as always, are picked by hand and placed in small crates so that the grapes are not damaged in any way. The back label refers to some of the information provided above. The words argilo-calcaire refers to the calcareous clay where the clay has been derived from limestone. The term ouillé is often used in the Jura these days and means “topped up”. White wines are treated in two different ways in the Jura. With some wines the juice is stored in old wooden barrels and some evaporates through the pores of the barrel. As the level of the wine goes down the wine becomes slightly oxidative. This wine, however, has been topped up from time to time to ensure that there is only minimal contact with oxygen to preserve the freshness of the wine. As with the Ploussard, this wine has been bottled (mis en bouteille) without filtration or added sulphites out of respect for the fact that it is a “living” wine. This is the first time we have been able to secure some of this absolutely delicious wine made from 100% Savagnin. It has been maturing in old barrels for almost three years. The back label refers to some of the information provided above. The words argilo-calcaire refers to the calcareous clay where the clay has been derived from limestone. The term ouillé is often used in the Jura these days and means “topped up”. This wine has been topped up from time to time to ensure that there is only minimal contact with oxygen to preserve the freshness of the wine. 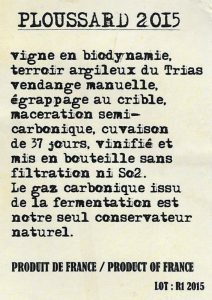 As with the Ploussard, this wine has been bottled (mis en bouteille) without filtration or added sulphites out of respect for the fact that it is a “living” wine. 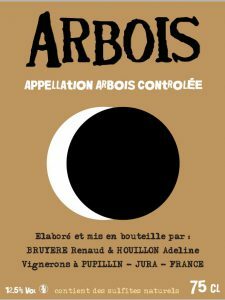 This is a sensational wine displaying all of the best characteristics of this jewel of the Jura. It has certainly benefitted from the time it has spent maturing in the old oak barrels.